Approximately 1.5 inches of snow fell Tuesday night. Most of the updated forecasts below reflect forecast snowfall from Wednesday night into Thursday night. Here's our in-depth weather discussion with Tom Novak of @NovakWeather from late Tuesday. Get the inside scoop like you've never gotten it before. Some have coined this season "Winter II." It certainly doesn't resemble anyone's idea of spring. Forecasters are tossing around some pretty significant amounts. As of 6 p.m. this Tuesday evening, most forecasters were predicting approximately 6 inches of snow while others (MPR and KSTP) were predicting a little more. A notable exception was the National Weather Service, which forecast a whopping 8-18" of snow. On paper (on monitor?) the amounts forecast suggest a significant storm were this midwinter; however, with April's snow accumulating inhibitors -- high sun angle, relatively warm surface temps, temps edging above freezing, etc. -- and a long-duration snow, we wonder if the impact will be as great as the public might otherwise be lead to believe. Blue represents forecasts from late news. Orange-ish font represents forecast as of mid evening Wednesday. 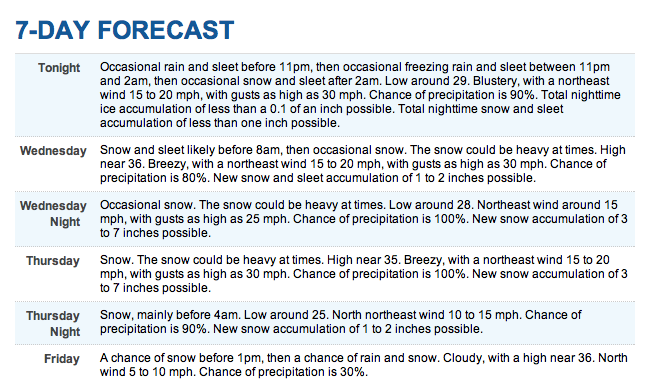 The Weather Channel: 4-8" (weather.com) (Per commenter below, forecast for 7-13" -- weather.com is very confusing. NWS forecast (weather.gov for KMSP) on Tuesday evening. Shaffer on WCCO did say while the 9.9 was showing on the snowmeter something to the effect of "keep in mind some will melt on contact and some will compact so you won't see 10" all in one slug... maaayybe half that when its done." Actually, I did catch that on the 6. This is amazing! I am so pumped! Let it be a record. Slow this baby down and let the snow not even have a chance to melt. The National Weather Service has been reluctant to use strong language up until now, but they are now there. Bring it! Dancing and peeing! Wow! Weather.com actually is showing more than 4-8". They just make you click through several pages to get the full totals. If you select the 5 day forecast, they only show the total snow for the day light hours, which does show just 4-8", but if you expand each day by clicking "details" you can then also obtain the night time snow totals. Thanks. I find weather.com incredibly confusing! My full description of what I expect is up on my website. I'm thinking 4-8" across much of the state including the Twin Cities. We'll be around 40 again tomorrow meaning no accumulating snow until late tomorrow night. A heavy snow band will move through the metro early Thursday, but as others have mentioned it is very difficult to accumulate snow during the daylight hours in mid April. That means wherever we top out at Thursday morning, should be pretty close to our storm totals. I just saw a tweet from @billborghoff of the NWS who says he expects 12-15" across the metro. I think he's nuts, but I'll be the first to eat crow and give him props if he ends up being right. In response to snow measurements. The official measurments (example at MSP, Chanhassen) happen every 6 hours. Noon, 6 pm, midnight, 6 am. For a measurment to be official, the spot of the measurement is then cleared away and the next 6 hour total is sampled. This is going to be a very important point when looking at these totals. Most other amatuer observers do not measure this frequently, or this consitently. Come on 13.7".........go big or go home! !.......if its going to snow,let's break a record I say.....I'm with you PWL! Bill, great video with Novak. Thanks. I'll take KMSP at 930, and KSTP at 10pm...Who else would like to help.?? And by the way I have bought into the heavier snow totals the last couple of Days, I hinted strongly at that yesterday afternoon in the previous thread. Talking Ian? I thought he showed snow meter with 7.5? snow graph showed 7.5" he said that's conservative, later it showed 9.9 at the airport. This just goes to show hard mets make it for us to understand! Two people can watch the same forecast and get confused as to exactly what was said. Just rain mixed with sleet in west metro(Maple Plain)for Novak's sake it needs to transition to snow,because he did say in the video a good chuck of the metro,especially the north and west metro will be in for a surprise tonight with snow amounts of 4,6 or 8 inches and that the TV mets were being conservative with this first wave. Pulling for you Novak,so that you prove all others wrong! Belinda still saying 3-8". 10" north of the metro. Belinda is holding tightly to her 3-8" forecast from 6 pm, which doesn't surprise me. They rarely make big forecast changes. The one change: she has adjusted the heaviest snow south about 10-15 miles. In Carver county, it just changed from rain to...I don't know what's falling. It's not sleet and it's not freezing rain. It's not SNOW. It's somewhere in-between all of those...and it's going to ice up fast once the temp drops. It is now thunder icing in Carver county. Flashes of lightning and big cracks of thunder...and dings, not splashes, against the house. Hot off the press....dear lord if this should verify, it's only through tomorrow at 2pm. For insomniacs and weather enthusiasts alike, we should have a video update posted by 11:30 p.m.
Paul Huttner(MPR)7PM update on his blog referenced the Halloween Blizzard saying that we didnt expect that to happen,but with the models showing up to 20" inches,he said he cant disregard the potential for a recording setting event in excess of a foot,its slim but not out of the realm of possibility. And just like that, thunder ice becomes thunder snow in Carver County. Coming down HARD and piling up rapidly on all surfaces. If it snows like this all night, Novak will be right on with his earlier prediction. Thunder, lightning, sleet and big fat snowflakes here in Rosemount/Apple Valley. Our deck has quickly turned white, much to my wife's chagrin. Wind blown moderate/heavy snow in Rosemount/Apple Valley for the past half an hour. The temperature during that time has dropped from 36 to 32 degrees. Everything is coated in white now. Just hand measured here in Minnetonka: 1.5 " on the grass and 3/4 " on the hard. Snow has stopped for now until the next wave and a fresh breeze is in the air. Kare 11 has adjusted their forecast to 6-10 inches. Paul Douglas is now saying 6-10 with up to a foot in spots. Going to go out on a limb here and say Novak was way too aggressive with last nights wave,yes we transitioned to snow and snowed hard for a little bit,but I'm sure he was thinking precip would move further north(didnt get beyond Anoka county)then just getting shunted to the east,got about 1.5 here in Maple Plain,which was about what most others were saying.Lets see how our forecasters handle the rest of the storm. No snow in St. Michael. Saw a dusting in Hanover. About 2.5 miles south of St. Michael. Interesting cut off. Was expecting inches when I woke up this morning. NWS sticking to their guns even with the red flag that Mr.Novak brought up in their late night video,their 6:21am weather story has MSP squarely in the 8-14 inch range with the updated winter storm warning text still stating the axis of heavy snow will be thru the twin cities metro with locally 14 or 15 inches. I know no one really believes it,but we'll all know in about 24hours! NWS has slightly reduced their totals from last night, now 2-4 tonight and 3-5 tomorrow for the NW suburbs, I just clicked around and seems they are thinking heavier south, noticed lakeville has a forecast of 3-7 and 3-5. Any thoughts? Aviation update for MSP airport says "at LEAST 8-10 inches of snow looking likely,with snowfall rates in excess of an inch a hour,with thundersnow also possible". When they use the phrase "at least",makes me wonder if their leaving more on the table.........time will tell! My prediction is that predicted totals will go up all day long, then the storm will not deliver that much. I've seen this movie before. I'm liking this theory myself. Usually big hype = no delivery. Not always though! A solid 1.5-2 inches of snow late last night in Rosemount/Apple Valley. It was quite windy and snowing at a good clip around midnight. I imagine that Bill is glad that there are many contributors to this site and that we are spread around the area so that firsthand reports from the metro, western WI, Rochester, etc. are available. It might be interesting and helpful for the people that visit this blog to have an idea of who is located where. Personally, I know where Bill, Plymouth Weather Lover, Big Daddy, Dyson Guy, MNPLOWCO (or whatever his latest moniker is lol), are located, but I am guessing that many others do not know this. It is just a thought. I will start by stating that I am in the southern burbs (Rosemount/Apple Valley). Jeez, Anonymous. ALL OF US have seen that movie before. It happens. It also happens in the summer with thunderstorms, but because of their hit-or-miss nature we rarely question the accuracy of the forecast, even when it's wrong. I LOVE a big snowstorm as much as the next person. And while they're far too infrequent for my taste, all I truly care about with this storm is getting the precip in any form. We need it, whether liquid or solid. Absolutely zilch all day Tuesday. Thought I would have 5+ on ground by now listening to NWS. Holding out hope for Thursday as it appears nothing will reach me until after midnight. Love the videos. Keep em coming. Love the handle. Thanks for the video feedback. NWS has sleet and snow in the forecast, any hints that this may reduce snow totals? I can def. envision more sleet than snow this time of year. Heard multiple reports of the storm trending a bit north with potential warmer air wrapping in at some point. Novak may have been right, and the first to note this if it verifies. Reports from where? Sources may help?! Kare's current forecast says "one model" gives Twin Cities only 4 inches. And Todd Nelson said that latest data shifts heaviest bands north of cities. Didn't Novak say MSP would easily see double digit snowfall totals? Incredible, tight temperature gradients across Illinois right now. 38 in Waukegan (north side of Chicago) to 83 in Cahokia (near St Louis). Not seeing much accumulation happening. The low has drifted more south east and a nice dry slot is forming...all this with april temps. Not going to happen...makes me sad. I think the NAM is overly optimistic. Going more with Paul Douglas and a total of 4 - 8. Think more SE metro will see even less. Takes a lot of energy (and luck) for what the NWS continues to predict. Which PD total is that? Starting Monday it was "coupe inches of slush" then 3-6" then 4-8" then 6-10" then 6-12" now back to 4-8"? At what point does his forecast become meaningless? Weather forecasts by definition become more accurate the closer you get to the event. How does that make any forecast "meaningless?" It's not as if he's an outlier. Yea, PD's forecast can become a moving target. And he often updates totals on the same post, so that evidence gets hidden. I wasn't endorsing Paul Douglas by any means. I just think his current forecast makes the most sense. I'll agree with Disco, modifications do not make the forecast meaningless. I can't imagine how difficult it is to nail a forecast this time of the year when temps are so key. I still can't understand why the NWS and others were calling for 10, 12, or even 15 inches of snow overnight tonight. Warm air has always been an issue with this storm. When's the last time MSP received a foot of snow with temperatures near or above freezing? We saw what 30-34 degrees did to our December and January storms, but yet we're going to get a foot of snow at that temperature in April? Those temperatures make for inefficient snow making and wet sloppy snow. When the NAM and GFS were going crazy with snowfall accumulations over the last two days, so did the forecasts. So much model regurgitation in the forecasting world today it is sad, which is why you see changes in forecasts every time a new model run comes in. We'll still get a nice heavy band of snow moving through the metro overnight, but I'm sticking with the 4-8" of snow I predicted yesterday. More will fall over southwest Minnesota where there is colder air. I can't argue with your logic. Also, it sounds like more of the snow may now fall during the daylight hours, and that can't help accumulation prospects. Question for the Meteorologists among us: At what point will the deformation zone set up? Looking at vis, enhanced, and water vapor loops, it looks like everything is still streaming north without a real wrap-around yet. This storm is a joke,were up to 40 again(which wasn't forecasted),that stream of moisture that Novak elluded to coming straight out of the Gulf is in Missouri and arching into Ill. And Wi,not pointing due north towards us,exactly where is our heavy snow coming from?I should add radar returns are filling in in west central MN but that's west and north of us,I agree with above Anon,bust! I really think you need to wait until the event is over to determine whether it's a bust or not. writing is on the wall,Bill. One other note,I thought winter storm warnings were a big deal,we've been under one for some 24 hours already with not much to show for it,maybe an advisory could have covered it better and IF this supposed heavy snow does come to frutition then it could have been upgraded to a warning.Too many long breaks/lulls to be in a warning,kinda takes away the signifiance of issuing it. Completely agree with warning comment. We've seen a few hours of wet snow that essentially had very little impact. If anything, it's sounding like a warning or advisory should go into affect around 3 a.m. or so. Actually, Wunderground forecast 43 for today. MN Forecaster: come for the forecast, stay for the whining. There is an explanation: the NWS in their discussion a couple of days ago when they issued the Winter Storm Warning explicitly mentioned that there was going to be lulls and that the storm was coming in waves but they opted for a long duration WSW to avoid confusion and cover the all period with a single warning. Now we may discuss the merit of their reasoning, but they at least provided and explanation. Interesting regarding NWS's explanation. If things are more or less panning out as they expected, I think we can question the merit of their reasoning. @Disco80: Ain't that the truth! Yes, if there are breaks expected but essentially it is all one storm, NWS forecasters will often opt for a single, long warning. This avoids inaccuracies of timing the starts/stops, which may be beyond the ability of we (humans) to accurately forecast. You also avoid things like "Winter Storm Warning in Effect from 8 PM Monday until 8AM Tuesday. A Winter Storm Warning is also in effect from 3 PM Tuesday until 3 AM Wednesday. A Winter Storm Warning is in effect from 12 PM Wednesday until 10 PM Wednesday." Instead, just go "Winter Storm Warning from 8PM Monday until 10 PM Wednesday" and describe in the text there will be breaks and hopefully at least try and get the timing into the digital forecast database where it is more acceptable to have a lot of adjustments take place. NWS has lowered snow total estimates by several inches for the west metro. Experts...any word on how things are shaping up? Is there a dry slot? Too much warming? Or are things coming around like the models said they would? He sure is throwing it out there,but I said it about an hour or so ago that the writing was on the wall,the radar and trends don't lie,but we have to hear stuff like thundersnow and godly amounts of snow,even at this moment the winter storm warning message has localized amounts near the metro of 12-15,give me a break,stop listening to the models and go old school.But who am I right?,just a dumbass anonymous that no one cares to listen to. New NWS weather story says system has slowed and heaviest snow band has shifted north,translation = metro bust! Actually, looking at the radar it appears that the heaviest moisture is going to nick southeast MN and move into Wisconsin. Bust!?! Any new info from Novak? Hearing the dry slot excuse now...met's favorite excuse. Boring...move along folks they did it to us again. Can we even count the 2" from last night as from the same storm? If it doesn't start snowing by 10/00 pm, we're looking at 20 hours and counting b/w lulls. MSP last reported snow at 2:00 AM. What letter are we up to this winter on the busted storm name list? I agree. It's almost a whole day's lull. NWS still going with 3-5 by morning for Shakopee. Not going to happen. I get that forecasts are missed, but the Winter Storm Warning needs to be dropped (or not issued a day ago). Someone is really being stubborn at the NWS. And P.S. Fox 9. We did not need to see a reporter at 9 PM standing over 35W. The road was dry and it's NOT SNOWING. Passolt made it sound like we should be lining up for bottled water. All that's left is for the Weather Channel to name this. They already did...two or three days ago. It's Walda. They did its called Walda! There is definitely a very pronounced dry slot through central MN/Iowa, but snow is rapidly developing in far western MN and eastern South Dakota. There is still a huge storm. The question is how much of it will make it this far east. The amount of moisture through the Mississippi river valley and the eastern Great Lakes is incredible. And for the record, it's mid-April, people. The Twins are in town this weekend. Why all the whining about a storm not verifying? I'm not exactly disappointed at this point. I have things on the to-do list that aren't exactly doable with a foot of snow on the ground. AROUND REDWOOD FALLS TO ST CLOUD AND THE TWIN CITIES. LOCALIZED TOTALS OF 12 TO 15 INCHES ARE POSSIBLE IN THAT AREA. TO THE 2 TO 5 INCH RANGE. This long WSW is a joke, its been up and down (mostly down in north metro) and everybody has given up. As was pointed out yesterday two people can watch the same local news weather guys and hear different things. A lot of people are calling bust because we have been under WSW with no snow or issues for too long. I have been trying to figure out if I should let my wife travel to St Cloud tomorrow and I am not closer to the answer now that I was two days ago. Let her go,the storm is a bust,the models fooled everyone! Someone earlier asked where's Novak with new info,I believe he was looking for the recipe for crow's pie to make for the all mets,just make sure Paul Huttner gets the smallest piece since he was the first with balls to raise the bust potential,all kidding aside though all they got is the models to go on and the models let them down,whats a poor met to do. Have you heard about periods? They're really cool, particularly when used in punctuation. You're barking up the wrong tree. I tried that on a previous thread and got shelled for it :) Something else I've never seen before reading this blog is forgetting the space after a comma. Let the tap dancing begin!Image just yesterday the words historic was being uttered for this storm,even someone brought up a comparsion to the Halloween Blizzard and now with the tap dancing you'll hear words like too much dry air,maybe even dry slotting or my favorite the dry tongue(ever try kissing with a dry tongue :)),others may even say the track wasnt favorable or too much warm air was drawn into the system,whatever they say bottomline is the models can never be trusted even the day of the storm.You take your licks and move on,I like to see whos brave enough to even mention snow the next 10 days,because according to the models the possibility does exist! I love this site and all but the anonymous trolls are overrunning it with their cries of bust. The height of the storm isn't even here yet, get a grip. Even if we only get 6" in the metro, I wouldn't call that a bust. Gotta love all the armchair mets that expect them to nail every forecast every time. Everybody has been saying from the beginning, especially the NWS, that this was a very, very tricky storm to forecast and is unlike what is normally seen this time of year. The models also struggle during change of seasons, so you have to take that into account. Then again, that's all if it even is a bust. We'll see in about twelve hours. Eric Jordan says: Okay I get that but if this storm diminishes to absolutely nothing or very little snow this will be the 6th snowstorm this winter season that has not done anything my only problem is is when you guys put out warnings people prepare for that they cancel activities they prepare prepare prepare and then nothing that's what's frustrating. Umm, the NWS never said to plan your life around a weather forecast. You just look like a jackass for saying that. What lull> never did get started. Still waiting. Now i hear that it may not start up until 3AM. I will not wait up for it. I will leave the milk and cookies on the door step. In an addition to anon at 7:04 it also said that the NWS pasted a larger area with the WSW to avoid confusion. Let's see. WSW in effect from 7PM Tuesday to now. Makes 28 hours early and counting. Northern Sticks, not sure of your locale (other than north of the Metro), but the default location for this site is MSP airport and the immediate Metro burbs. With that said, there was an average of 2" b/w 11:00 pm and into 2:00 on April 10th in the metro. My location was under the same WSW as the "metro". I was giving the locational status as some of us earlier had said would be a good idea. I was also commenting on the blown NWS forecast for my area. There seems to be a default going on here that whenever the site tries to move from the stunted metro someone always has to throw water on the party. If this is truly a metro only site, then goodbye. The site is for people who seek to better understand weather and weather predictions in this area. For purposes of evaluating the performance of forecasters, we focus on the metro simply because the MSP airport is a solid measuring stick for this area. However, our discussion of weather features obviously spans a larger area. Was it 28 hours early for the folks in Worthington who have no power because of the ice? Hold up all you negative naysayers in here, even if the storm busts, which I haven't given up hope yet that it has, if there was one time we wanted a bust it would be now wouldn't it,since most are looking for spring to arrive. Rather pure sleet falling in St. Paul. Hey Anonymous Nostradamus(es). The 700 mb low is still over eastern Nebraska [1,2]. It is forecast to move to the northeast and be over La Crosse by tomorrow evening (!) then Green Bay Friday morning . Why is that important? The old rule of thumbs is the heavy snow band lies just to the north of the track of the 700 mb low. There is a significant amount of moisture with this system . Yes, it is above freezing right now, but the air is still fairly dry . As precipitation forms and falls into that dry air near the surface, the resulting wet bulb effect will cause temperatures to fall below freezing. The atmosphere further above the ground will cool as well as additional cooler air is pulled in from the northeast . So, by all means, do not write this thing off yet. Yes, it is April, but it has snowed significant amounts during April in the past. Most recently, in 2002 there was over 20" of snow in April at MSP. TWC.com "Chance of snow 55%. Snowfall of less than half an inch through 5:30am." Guess I can sleep through the night. Temp right now is 39. Wet on the hard. TWC says 3-5 " through tomorrow. Goodnight. Oops just re-checked before I posted this. TWC.com now (2 mins. later) says "Chance of snow 30%. No significant snow accumulations through 5:00am." I'm willing to give credit with a correct forecast, as well as critque a missed forecast. Even if MSP still gets to double digits, the timing has been incorrectly forecasted (imo). I know that may be nit-bicky, but why not have a high standard? With hindsight, there is not doubt that we (Twin Cities metro and surrounding counties) should not have been in a WS Warning all day. Worthington and points around there, that is another story and it seems warranted. Although after seeing some video of the ice situation down there, I think an Ice Storm Warning would have been warranted vs. "just" a WS Warning. I wouldn't mind seeing some thundersnow and some banding to give us one last winter wonderland. The ice can stay away. Going back to P's post at @11:57 pm with the 700mb low. I saw that as well. I will add something else very interesting to that, by tomorrow say around 4pm to 7pm a surface low will develop over northern IA. That will act to drop more heavy snow over the metro through Fri morning. As has been stated before this system has slowed down meaning changes are likely by tomorrow afternoon. Here is the surface map from the High Resolution Reg GEM model at 7PM Thursday evening, and just about every model out there shows this, the only one that does not is the Euro and it waits til 7pm Friday to try and develop it, it may be known as the king, but this year it has been less than stellar. I'm still in forecasting mode with this storm, believe it or not. However I feel like the WSW will have to be extended into Friday morning say around 12pm. The Euro has handled this system better than any other model out there, especially the NAM/GFS. The Euro has held off any decent snow accumulations until Thursday morning since before this storm even started. Heavy sleet for the past hour here in Eden Prairie.....robbing the snow totals I would assume since everyone was thinking the motherload precip Wednesday night was to be in the form of snow! Yep, looks like glaze on a doughnut out there. Krispy Kreme's for everyone with their coffee this morning! BUST!!! Nothing but RAIN mixed with a little sleet in Burnsville. Looks like Novak was right when he expressed concerns about the warm layer at 700 mb coming up over the Twin Cities. Snow? I don't see no stinkin' snow!! At least one computer was right about this storm. Good job to you too Novak. Sleet just transitioned to snow downtown. Huge flakes! Novak had MSP getting 9-12" two days ago. How is that a good forecast? Sleet transitioned to heavy wet snow about 5:30am here in Eden Prairie....now lets see how much we get. Wow. Definitely not what I expected to wake up to. I can still see grass in my back yard in Minneapolis. Heavy sleet appears to be melting pretty quick too. Yuck. Glaze out there. NWS finally dropped MSP snow totals to 5-8 inches. I think we all need to give Randy Hill the gold star as he was the only one, for a couple days, not buying into the very high totals that were being forecasted. I appreciate all the contributors and their interpretation of models all the while struggling with the many variables to filter through, however, it's been the same story all winter...build up a storm only for it to fizzle. My question for the pro/semi pro Mets...it's obvious that modeling forecasting is only as good as the product. Is there or has there been feedback given to the people that maintain these models that their product is/has been failing miseralby. I understand the Euro went through a big upgrade but what about the US Models. This is very frustrating. And yes, people to alter plans due to weather forecast, contrary to what some believe posted above. 2" of heavy wet snow in Minnetonka at this hour. WOW THUNDER....Did you hear that. What is most frustrating from a forecasting standpoint is the timing of this storm. I believe many of us were surprised that the snow didn't start falling until about 5am or so. That is about 6 hours behind what I had expected. Besides that, this storm is behaving about as expected. My prediction has always been for a solid 6"-10"+ snow over the MSP metro & I'm sticking with it. The heaviest snows on the NW side of town. Over southeast MN, I was worried that warm temps at 700mb to 850mb would create sleet/rain and this would cut into the totals. Last night, I became concerned about a dry tongue associated with the 300mb Jet winds that would shut-off the precip just southeast of the MSP metro. All of this appears to be verifying. The wildcard will be what happens after this initial impressive surge of moisture moves through the MSP metro this AM. How much trowel and/or wrap around moisture are we going to receive? Will we get another 1"-3" this evening & overnight? There is potential for this. Back end of heavy snow shield moving up thru Red Wing and Lakeville,snow will begin to taper in an hour or two around the metro. Say what you want about this storm but with all the hype it received it was a bust,it didn't live up to the expectations the models laided out just yesterday. I also concur with an earlier comment that Novak wasn't stellar with his forecast, he was as aggressive as the NWS(he even applauded them in one of his videos).Know I now most everyone here loves him for being the "in-house met" and the videos he does, but he shouldn't be exempt from the grading/criticism that other mets get.I love the videos and his knowledge of weather, yes he explained the change in the forecast but he was also critical of the TV mets on Tuesday night when he said they were all too low with the amounts on the first wave, when he was saying 4-6 inches. In the end the models failed the mets, but strong kudos does go to Randy Hill he nailed this one and didnt bite on the large numbers the models were printing out on Tuesday! I absolutely agree with all of your points!! This storm was an underperformer for the Metro. The forecasts were way overblown. This has happened several times this winter season. We have had thunder and lightening here in Bloomington and have an easy 3 on the railings and a couple on the hard. It is snowing heavily at the time as well. I t will be interesting and fun to watch how things develop and play out over the next 24 hours. As long as we have a mess lets make it a big one. Things have developed and it has played out,back end of snow moving thru south metro as I type,golden shovel will not come from in or around the metro. I am not writing things off yet. I don't know but until things clear up there is still potential. Plus I am having fun watching my kids have an epic snowball fight while they are waiting for the very late bus. Significant thunder and lightning up here south of the 35W/35E split around 8 am. Intensity has dropped now at 8:30. Yes, it was a bust for the metro. "Many reports are coming in with over 8" just west of metro" is not the same as reports actually coming from the metro. Close only counts with horseshoes and hand grenades. When there are continuous forecasts for at least two days preceding the start of the storm of 6+ inches, and official forecasts of up to 14 inches (NWS) and we generally squeeze out about 3 inches, then that's a bust. Hmm...maybe not a bust, but when multiple forecasters show models all week long that show totals around 20 inches, it sure feels like it. I know no one was technically forecasting that much, but it doesn't matter. For untrained eyes like mine, showing a model is like saying, "This is technically possible." Sitting at two lousy inches in Minneapolis right now. Light snow showers. who in the heck showed 20"???? Showing raw GFS data is crazy. Most forecasts I saw showed a range from 4 - 8" or 6 - 11" These totals are verifying or will by tomorrow. Yes sleet did bring some totals down a bit but there was quite the impact this AM. 150 flight canceled, light rail shut down. Thierr is also the timing aspect. First thing I hear at the office this AM is where is all the snow? And I am talking in downtown St. Paul (if you want to call St. Paul the SE Metro). So I guess the good news is that for everyone that got up early , they probably ended up getting to work earlier than on a dry day. It may not be a total bust, but definitely not a 100% successful forecast either. No one "forecasted" it @Hammer. I read this site religiously and never comment. I love the insight from Bill, Novak, Randy, Duane, and others, but lately its becoming a bit comical with all the negativity. Just my $.02.. Keep up the good work all. Yeah I figured that. But again, to untrained eyes it just looks a bit more possible than you or others might think is realistic. I'm not trying to be critical. I can't imagine it's easy to forecast snow in April. I agree it wasn't a bust, just seemed to underperform a bit at least where I am in South Mpls. Whatev. Pretty cool to see in April. Now, melt!!!! This is not a bust and the talk of it is silly and is just trying to jab. Stop it. This is amazing! And it would have been doubly amazing if the snow would have started earlier. There are just way too many variables this time of the year which makes forecasting very challenging. Kudos to Novak, NWS, and the rest for warning us of this event. Many were were scared to even use the word "snowstorm" when they were talking about this event early this week. They just didn't want to believe the models. They were being cautious and that is fine. But great job of giving us all the information, including the crazy model information. This snow is amazing--we are talking about April 11th!! Brought it!! Everyone has their own opinion as to whether this storm was a bust for the TC. That is fine. Whether this was a bust will depend upon each individual's definition of that word. I do agree that the storm did not live up to its hype about snow for the TC. Whether that means it was a bust or not is an entirely different question. I agree with PWL, not a bust at all. I think people were slightly misled of the longer than expected lull on Wednesday, but considering there was 1.4" on Tuesday night/Wed morning plus at least 4-5 inches today (and btw it is still snowing here in St Louis Park at a decent rate) we will get to about 6-7 inches. So maybe on the lower end of the ranges forecast, but still technically not a bust. If I forecast 6-10 and it snows 6 inches I am technically right. I don't care what anybody calls it, a bust, success or whatnot. I just love to watch it snow! I love snow!! I always have and I always will! In my opinion, a steady snowfall with medium to large snowflakes is one of life's most beautiful sights to behold. It is snowing steadily in Burnsville at this hour. I am hoping for some more accumulation. We got an inch and a half from Wave 1 Tuesday night and two and a half to three inches so far this morning. What I'm seeing is the snow totals forecast for Mankato and areas in Southwestern Minnesota were generally right on the money. For the Twin Cities Metro, and areas south, the actual snowfall amounts received were much lower than even the latest NWS Weather Story graph, which cut them almost in half in So. MN. If you add the less than forecasted snow amounts with the extended Winter Storm Warning which wasn't warranted, I really don't see how you can't be disappointed in the forecasting. The true kudos goes to those forecasters days ago that were seeing too much warm air to produce a "snowmegaddon" style snowstorm. They nailed it. Huge snowflakes coming down again here in Bloomington. It had slowed/ stopped for awhile and has started up again pretty zealously..
Is Fargo going to see more snow from this than originally thought? What's the latest flood prognosis up there? 4.5" on the hard in Golden Valley,not sure how accurate that is with compaction and melting,its just me and my ruler on the driveway. Amazing looking at the radar over the last half an hour and seeing snow petty much parked over Minneapolis. Still snowing in St. Paul right now, but it must be much heavier over Minneapolis at this time. 2.7 inches in south mpls, not far from airport. How are the immediate metro counties still in a Warning? I'd love to be more positive about how the NWS handled this one, but I can't. A two day Winter Storm Warning was not warranted. Official total at Chan is 6.1". 2.1" yesterday and 4.0" since midnight today. The NWS was talking 12-15" amounts for the metro and even stuck to higher totals last night. TV stations then picked it up and ran with the sky is falling. This is exactly why Dan Barriero started his "weather terrorist" label. Part was tongue in cheek with Paul Douglas, but the other part was how much weather is getting overplayed in the media. (Hammer I respect your forecast but I'll bet your station ran this as the top story). This board is great, it's full of folks taking stabs at the weather and it's obviously difficult. I hope the core people never leave right or wrong. P.S. I see the Winter Storm Warning has finally been dropped to an advisory. Check out the updated 5:43 weather story from the NWS.........no wonder their totals were so high the last few days,they were on "Weed"....see if you can find the spelling error........:) pretty funny! Too late......at 5:53 they updated it and fixed their spelling error,where it said next week on larger grahic on the left it read "next weed"...pretty funny if you saw it,but you only had 10 minutes to see it. I can't speak for the cities, but I will say one area that this storm did not "Bust" is up here in Duluth. Have officially seen 5.5 inches with another 4-8 now forecasted overnight. Kudos to Novak for correctly forecasting higher amounts in and around Duluth. This storm doesn't want to leave...moderate snow here at Eden Prairie at the momment,probably an inch of accum. so far for this evenings little burst of snow! out of our high flow bobcat blowers. Shooting water 40ft in the air. Just left Big Daddy's area in EP. Still snowing and coating what we just spent 12 hours clearing. Maybe more "fun" tomorrow. Cheers and have a good night.